Nestle India has learnt from the backlash that the company received due to its delay in responding to allegations of lead and MSG content above the permissible limit in brand Maggi Noodles in 2015. 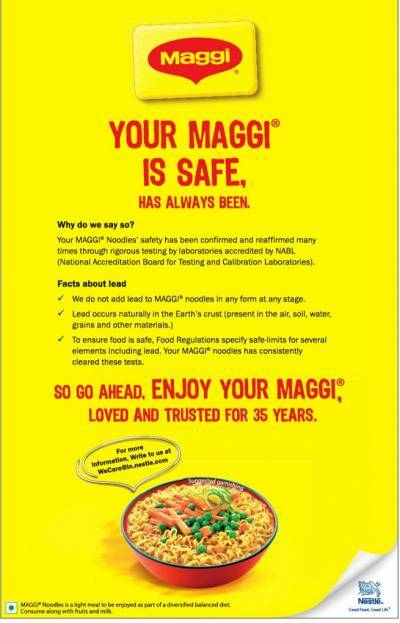 With the controversy of lead content in Maggi Noodles resurfacing, Nestle India has come out with a campaign to reassure consumers of the safety of the immensely popular brand. It may be recalled that in 2015, the Consumer Affairs Ministry for the first time ever invoked the 3-decade old Consumer Protection Act and filed a complaint against Nestle India in the National Consumer Disputes Redressal Commission (NCDRC), alleging the presence of excessive lead content in Maggi Noodles and flavour enhancer MSG. The FMCG brand was investigated for indulging in unfair trade practices and misleading advertising. 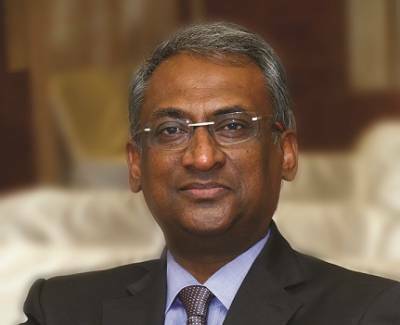 The media blitzkrieg of outrage that preceded the class action suit and the subsequent PR disaster on part of the brand compelled Nestle India’s top management to step down, although Supreme Court declared that they found no trace of lead in tested samples. That was the impact of one random test of their product that found high levels of lead content in their product. Now, Nestle India has admitted that there is lead content in Maggi Noodles, though it is well within permissible levels, the SC has decided to revive the old class action suit and has brought the instant food category brand once again under the scanner. The fallout of the 2015 row had brought down Nestle India’s share in the instant food category from 77 per cent to 42 per cent, as per a report by Nielsen. At that same time, competitors like Sunfeast’s Yippe Noodles increased their market share significantly. Since then, Nestle India has recovered some ground, with its market share climbing up to 60 per cent. 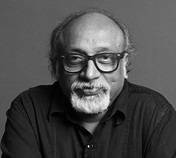 In conversation with Adgully, media observers and brand experts share their perspective on Nestle India’s consumer outreach programme and the far reaching consequences of brand perception. A brand which claims to be focused on health and nutrition has many products and categories which are antithetical to the concept of nutrition. Apart from their advertising being misleading, their products like Maggi carefully print their nutrition facts on the unreadable crimp, but claims like ‘High Iron’, etc., are boldly shown with high visibility. Even a research of nutritional claims made is almost 9 years old. If a health and nutrition company spends on market research and product testing only one-thirtieth of their advertising, you know where their focus is. Consistent performance over time allows residual trust to settle in and, therefore, makes a brand more believable. However, if the brand repeatedly breaks the trust of consumers, the residual trust will be eroded very fast and is much more difficult to regain. One can’t show their legacy to counter poor product or misleading advertising issues. Lead is found naturally in the environment, so it would be present in every product. At the same time, it is clear that the amount of lead in Maggi is well within the permissible level. If you see the pesticide controversy in soft drinks, it is the same case. The ground water has some amount of pesticide, which will naturally percolate in the soft drinks, vegetables or any product that uses water as a resource. So, there is a permissible level of contamination and any product should be within those levels. That is the contention in this whole case. If Maggi products are within the permissible levels set by the Government, then why should anyone have any problem? That’s transparency isn’t it? The whole situation has been escalated by fake news on WhatsApp that has become quite damaging for the company. Therefore, they have put out an ad to help people understand what is wrong and what is not wrong. In 2015, the top management of Nestle did not respond, which led to a change in top management. It came as a shock because the news didn’t come from news authorities. It was an isolated story from one city in the country. Even the Supreme Court has asked for clarification as to ‘Why there is any lead content at all?’ which Nestle has to respond. You cannot change the entire ecosystem that we are living in. Maggi was one of the biggest players in the instant food category 35 years ago even though there were other players. When this issue came in the media spotlight, there were loyalists of Maggi who have grown up with the product who stood up. They brought up the point that there have been no negative effects of eating the Maggi product. All these years they have been fine, they have never had any issues. That was a very positive thing that despite the media being fierce and unforgiving. Maggi has made the right move by ignoring the media who is making accusations and speaking directly to the consumer. At the end of the day, it is the consumers who need to believe and the Government that needs to make the law. If you obey the Government laws and the consumers believe you, then what is the issue? Cadbury and beverage brands have faced these issues. I would say a brand like Patanjali that says its products are more natural than other products – those ads are more misleading. Don’t they use preservatives? Will fact-based approach to communication resonate with consumers? 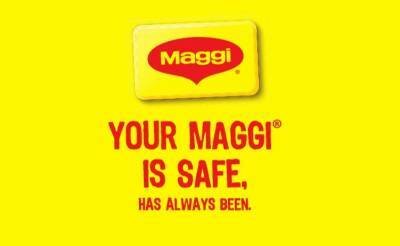 Suppose I am a Maggi fan and you are a Maggi hater; how will I convince you that Maggi is safe? Using the facts right? Information is the key to set the narrative. If there is anything wrong with the manufacturing and if they have flaunted any norms then the government has the right to pull them up. But right now it is just an accusation that the media spread like wildfire that has damaged the reputation of the brand. Thankfully, Maggi seems to have learned a lot from a similar situation they faced in 2015 and have been much quicker to take control this time around. In 2015, they were caught unprepared and were quite late in starting their marketing campaigns to counter the negative sentiment around their brand. This time, they were not only quicker in reacting, but also much smarter in terms of the content of their messaging. In 2015, their copy oozed of brand loyalty gained over the years, with the ad focussing on 32 years of association, immense love and trust. The only elements of facts they mentioned were about self-tests and FSA approvals from 6 countries. This time, however, the brand did not just focus on loyalty and accreditations, but also called out the real big villain - Lead. The most important fact clearing happened with 2 bullet points that stated, “We do not add lead to Maggi Noodles in any form at any stage” and “Lead occurs naturally in the Earth’s crust (present in the air, soil, water, grains and other materials)”. It almost put the presence of lead in Maggi Noodles as an “Act of God” of sorts, instantly acquitting Maggi. This, clubbed with the mention of clearing tests, does make the consumer believe that Maggi is in the right here. 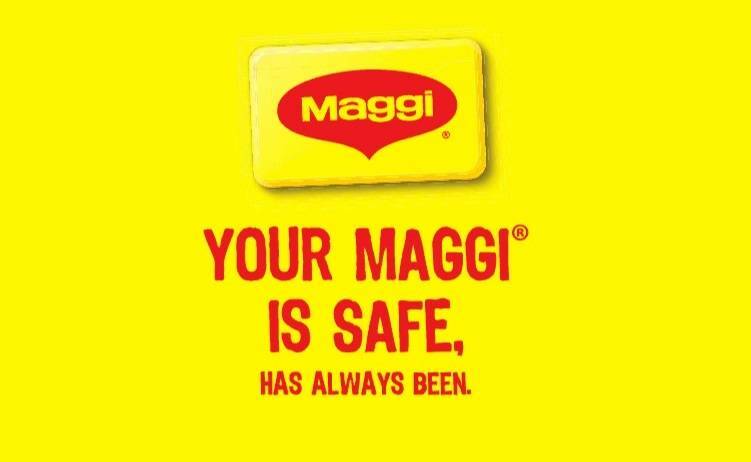 For a brand like Maggi, that is so close to the hearts of many Indians who are almost looking for a reason to put their faith back in their 35-year-old friend, the ad copy provided exactly that. Maggi has been the clear winner and has ruled the roost in the Indian market for the past 35 years. From kids to students to parents, across the length and breadth of a country as big as India, Maggi has done everything right- distribution, new product launches, advertising – for a really long time. They have been rewarded by their consumers for these efforts by a market share and loyalty index seen by few brands. While it is true that the brand longevity adds to high levels of trust, it also means that the angst owing to that trust being broken is of an equally large magnitude. The burning of Maggi packets and celebrity effigies back in 2015 is visible proof of that. What comes to the rescue is an integrated, strong crisis management and marketing effort from the brand, aimed at quickly reinstating customer trust and confidence in Maggi. The new age consumers are not only better informed but also more evolved. They keep themselves abreast with the factually relevant details on what is good for their family and themselves. These discerning shoppers are not easily swayed by marketing gimmicks and are better convinced by fact-based communication. Of course, it can’t be vanilla bullet points of facts and figures, but more customised communication depending on the region, service or product, or the medium. The last is especially important as this can deeply influence your strategy, for example, a more fact driven approach for Print, while a branding plus fact driven approach for say, TV. FMCG, in particular, has historically seen a more emotional approach since taste can be subjective. More so for a product like Maggi, where there are no nutritional aspects to boast of. The emotional approach worked for the “Maggi Mom” image the brand created back in the 80s. Now, with the moms becoming more cautious and informed, the fact-based advertising also kicked in, not just in crisis management, but also in creating and advertising new variants like Atta and Vegetable Maggi. 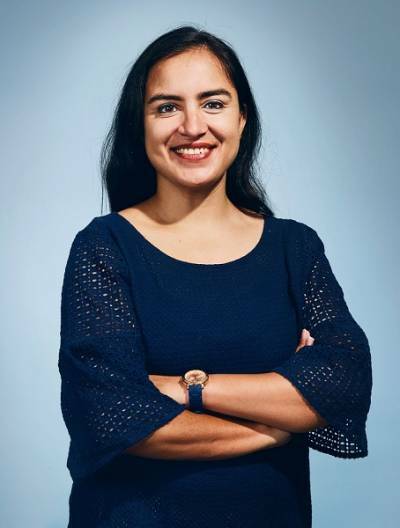 Especially in the current scenario, with consumer emotions running high owing to accusations of the presence of lead, fact-based communication was definitely the need of the hour. It was fundamental to winning back the trust of the consumers who are seeking explanation from their long-loved brand.